In college, we tend to dream about our future in the most idyllic way, particularly as it relates to the day-to-day activities of our would-be professional career. Aspiring doctors imagine saving lives, teachers inspiring students, attorneys winning the big case and bankers bathing in piles of money. Even for those of us lucky enough to enjoy a fulfilling career, the daily reality of our job is often far less than glamorous. Like everyone, I certainly have my challenging days, but I couldn’t have asked for a more perfect day at the office than my recent digital film shoot with Fury Water Adventures. 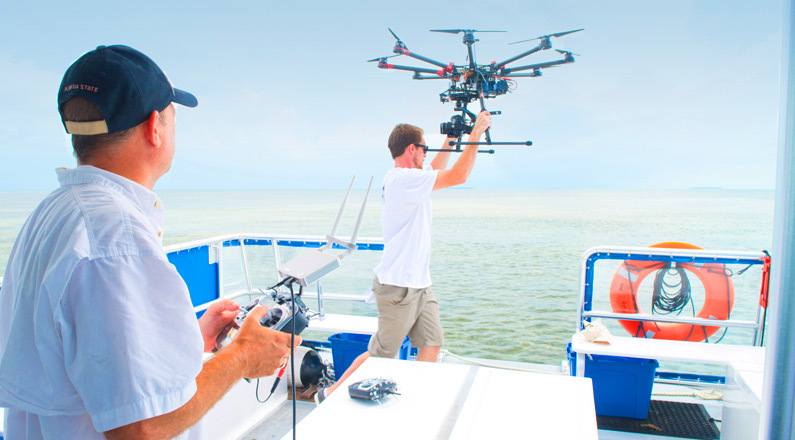 Our Miami advertising agency teamed up with Fury, Digital Island Media and Vivid Aerial Media to capture a day on board Fury’s Island Adventure. Fury and BlackDog spent more than two weeks both planning and scouting for the two-day shoot. There are many challenges involved with filming in, on and above a remote location. One drop of saltwater could ruin the expensive equipment. After carefully selecting the right day and the right gear, we traveled to Key West’s beautiful backcountry with our crew to begin work in paradise. Digital Island Media put their award-winning film and production skills to work to capture cinematic digital film underwater and on the ground. The Digital Island team used a Canon C300 as the main anchor camera, Nauticam Canon 5D Mark III underwater housing for both underwater and splash zone shots and a GoPro for specialty shooting. Their unique MoVI Gimbal video stabilization technology allowed us to shoot a digital film in a way that no other piece of equipment can in the midst of waves, sand, and seawater. They even employed a dingy in place of a typical photo shoot dolly to adapt to the remote island location. Vivid Aerial Media used a cutting-edge technology called Unmanned Aerial Systems (UAS) that resemble small helicopters to shoot aerial photos and video, with the added bonus of increased maneuverability and the ability to fly low to the ground. Since the UAS have a live video download feature, I remained on the boat to direct the expert drone pilot while simultaneously talking to our models via two-way radios. I’m sure they all got tired of me shouting, “don’t look at the drone!” as it swooped down from the sky just above their heads. In the end, I got to spend a few weeks in paradise doing what I love with a group of very talented people and was reminded once again that I am lucky enough to have the job of my dreams. Special thanks to Scott & Tammy Saunders, Eliza Warren and the Fury captains & crew who helped in the making of the Island Adventure video.